The idol of Lord Vishnu, presiding deity at Kerala’s Padmanabhaswami temple, where mind-boggling treasures have been discovered, is itself made of 12,000 ’salagramams’ or sacred stones. The stones, brought from Gandaki river in Nepal, are bound together by a mixture of herbs and resins, a sticking subtance. A book on the Travancore royal family which maintains the temple reveals that the 18-foot Vishnu idol bears the images of a whopping 33 crore celestials in conceptualised form, besides those of goddess Lakshmi and Bhoomi Devi as well as sages. These details form part of a book on the Travancore royal family. The book, “Travancore: The Footprints of Destiny” has been published by Konark. The temple hit the headlines after a Supreme Court ordered scrutiny of five of its six chambers uncovered a rich treasure trove including ancient gold coins, gems, antiques and cash. The temple has in its archives the largest collection of cadjan records. It figures in four Puranas. Thiruvananthapuram derives its name from Tiru Anantha Puram- meaning the city of Anantha, the serpant god on whom Lord Vishnu reclines. With a history dating back to the 8th century, the temple was destroyed by fire in 1686. It was rebuilt in 1729. Legend has it that god Balarama visited the temple and bathed in the holy pond and donated 10,000 cows with horns adorned in gold to the Brahmins. The Krishna shrine in the seven-acre temple complex is older than the main shrine. Subsidiary shrines are devoted to Ganapathy, Ram, Narasimha, Ayyappa, Vedavyasa, Garuda and Hanuman. The seven-storied tower, or Gopuram, pieces the skyline, looking like a boat. The “Kulasekhara Mandapam” in the complex carries a wealth of intricate granite sculptures, says the book. 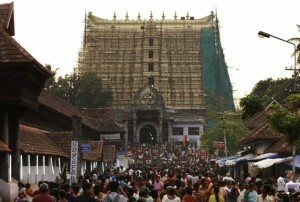 The “Ottakkal Mandapam”, facing the main idol, is a single slab of granite, which is 2.5 feet thick and 20 feet square in area. For the temple festival, the cord for hoisting the two flags is still made by the inmates of the Central Jail in Poojapura. Unique to the temple is an elaborate bi-annual ritual of sanctity called “Bhadra deepam”, literally the worship of the lamps. It is the only temple in India to observe “Bhadra deepam”. The 12th Bhadra deepam is celebrated as Laksha deepam, when the Travancore Maharajah offers gold, cash and a length of silk, a tradition that continues even today. On the wide avenue leading to the eastern entrance of the temple, giant figures of the Pandavas are installed. The images, carved in wood, are more than 25 feet in height and are elaborately painted and decorated, the book says. Besides priests and their assistants, the temple has other employees such as light carriers, guards, musicians, cooks and vessel cleaners.